A man who come from outside of Japan is walking along the mountain path to the temple, Chikurin-ji in Kochi. He is wearing a white cloth called byakue, a straw hat called suge gasa and holding kongou zue which is a stick, and a big back pack. He doesn’t smile at all because of the steep hill. He finally find the signboard on which is written “Chikurin-ji”, but he also find long stairs. The man is wearing the traditional garb for the pilgrimage in Shikoku. Most pilgrims from foreign countries also wear the garb even though it is so casual style sometimes. Foreign pilgrims are gradually increasing, and foreigner is not super unusual anymore. International connection is increasing in Kochi through the pilgrimage. The pilgrim in Shikoku is called Shikoku Henro. Pilgrims in Shikoku visit the 88 official temples where Kukai (Kobodaishi) is believed to trained or spent time. In Kochi, there are 16 temples, 24th to 39th. The first temple is Ryozen-ji in Tokushima, and pilgrims visit the temples Tokushima, Kochi, Ehime, and Kagawa in order. The last temple is Okubo-ji. Chikurinji temple is atop the hill known as Godaisan, in Kochi, and is the 31th temple to visit. Monju-Bosatsu who is a Buddhist saint of determining people’s wisdom is worshiped in this temple. There is a proverb which is 三人寄れば文殊の知恵 (sannin yoreba monju no chie) in japan. The proverb means that if three ordinary people gather, the wisdom is about same as Bodhisattva of wisdom appears. “Two heads are better than one” is almost the same meaning in English. The origin of this Shikoku Henro which is Kobodaishi is also worshiped in the temple, and it places right in front of the Bodhisattva of wisdom. “People come this temple and pray to get good score of exam. Also, the Bodhisattva of wisdom is effective for judgement as well, so people who want or need to make a decision for their life come to this temple,” explained a woman who works in Chikurin-ji temple. People can start pilgrim for any reason and there are no strict rules. But there is one thing that people should know. There are many religious issues in the world, but there is no confrontation of religion or nationalities with henro. “The pilgrimage should not be considered a stamp rally, but as a religious journey” said Tourism Shikoku. If people walk, the entire route is about 1400 km, and in average, it takes around 40 days. Some people use public transportation, bicycle or car. Pilgrams can decide the level themselves. 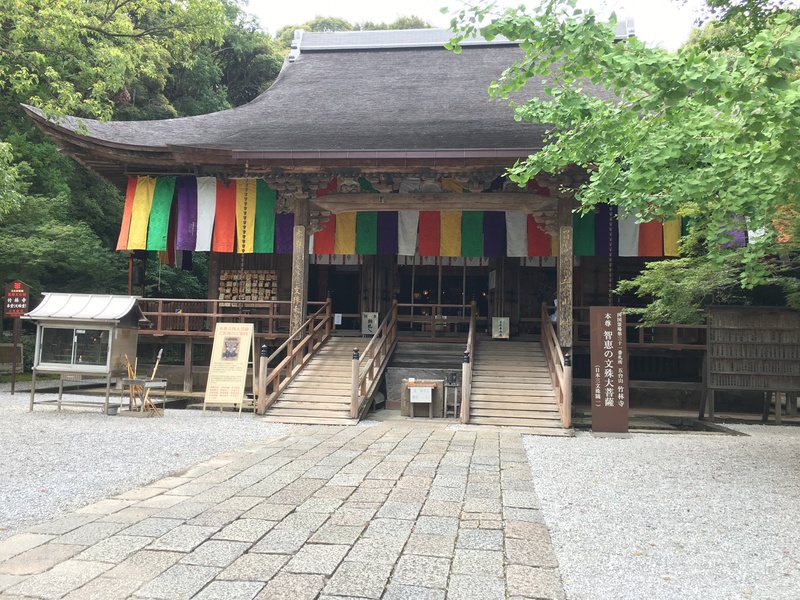 “In Shikoku pilgrimage, the goal is to visit all 88 temples, many of them are built on top of mountains, to choose walking is considerably more challenging,” said a woman who is from Alaska and finished Shikoku Henro by walk. In the past, pilgrims did pilgrimage for training, but people do pilgrimage for many reasons now. Some try to refresh their hearts by seeing beautiful view in Japanese countryside. Some want to escape from their normal daily life. Some are interested in this culture. Some would like to pray for healing or safety in the home. Some come for religious reasons. Pilgrimage have the meaning of breaking off with reality and journey to other world, so pilgrim people wear white clothes and cut the connection with home town and any bonds. Everyone has different reasons to do pilgrimage. It is not only for training, and it is not only for Japanese people. People who came from outside of Japan know about ohenro through the internet or media and they have an interest. In the past time, Kochi didn’t have much connection with other partly because Kochi was one of the penal colony. It means that people who committed a crime were sent to there. In the isolated situation, however, Kochi have built its own culture, and now the international connection is increasing through the henro. “In maeyama ohenro koryu salon (interaction salon for pilgrims in Maeyama), there is a roster for pilgrims to write down their name. In 2007, there were 70 foreign pilgrims’ names. In 2012, there were 150 names. In 2015, there were 400 names” said a professor in Ehime University. There are many good comments for the Shikoku Henro, and the most commented impression is about hospitality for pilgrims. To accept more people, some problems are remaining yet. It is essential to make signs or displays with English or other languages in stations and the way of mountain more. Then foreigners are possible to do henro or sightseeing safely. He walks up the long stairs and take a deep breath. He washes his hand with clean water, and go to the main temple building. He recites sutra. He looks so natural at Chikurinji temple. Next The “Manga Kingdom” of Kochi! I didn’t know about Shikoku Henro meaning and history, so I am glad to know that! It is very tough work, but we can get a lot of benefit. I’ve been to the Chikurin-ji, and experienced how hard to climb that stairs. However, that place was really good and the view from the top was amazing. Nice story! I didn’t know Shikoku Henro accepts whoever has their own region and races until I read this article. It’s an interesting story! Through reading your article, I understood the history and it attracts many people, not only Japanese but also foreigners. As news said, there are many foreigners going for henro. It’s a way to promote foreigners to come and visit Shikoku, especially in Kochi, and experience the different lives what we have now. Pictures are beautiful!! I like the combination of the last part of story and stairs picture!! Good article!! Shikoku Henro is very hard, but many foreigners do Shikoku Henro. I was happy to know that. It’s good story! I think it gives me a good time to know about the history and I want to know more about shikokuhennro. Kagawa is also a famous place for a part of Shikoku-Henro, but I didn’t know much about it. Reading your article, especially about the relationship with foreigners made me more interested in this! I regarded Henro as stump rally and I didn’t know each temple has a specific benefit for people before I read this article. With different mind, I’ll go to Chikurinji.